The majority of world's leading pork-producing countries are expanding. Where will the extra product go? America’s pig farmers are producing more pork with a 3% jump in production this year. As the U.S. pork industry produces more it is reasonable to expect prices to drag, explains Dermot Hayes, Ph.D., Iowa State University economist, to an audience at 2017 World Pork Expo. Yet, hog prices this year are still decent, and the main reason is strong pork demand. Looking at second quarter numbers, Hayes points out that pork production climbs 3.4% whereas pork demand is a net increase of 4%. The growth in pork demand is not domestically as it remains relatively flat in 2017. Exports account for the majority of the increase in pork demand so far into the year. Looking at the big export picture, the United States is shipping more pork this year to its international markets except for China, which remains unchanged. Canada, on the other hand, is only up 5% from the previous year. Canada is exporting so much to China, up 123%, that all its other international marketplaces show negative gain from 2016. China imported additional 3 million tons by the end of April 2017, making it the No. 1 pork importer last year. As a result, Hayes says it kept the European Union and Canada busy while the United States backfilled pork to the remaining countries. “We (U.S.) are getting the benefits of China without actually shipping a whole lot of product there,” notes Hayes. Turning to the European Union, the growth in Spanish pork exports is often overlooked. Hayes says Spain’s pork exports to France and Italy are flat to down, but it is shipping substantially more to China. Currently, it is exporting 2,000 20-ton shipping containers to China monthly. Similar, Germany’s pork shipments are up for China, but down to its other traditional markets. Hayes presents global hog production benchmarking data from a collaborative international project (accounting for exchange rates). 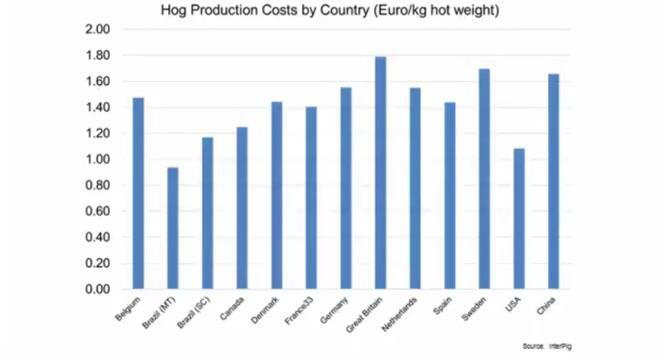 With the exception of Mato Grosso, Brazil, the U.S. hog production costs are lowest, especially for finishing hogs. Although Mato Grosso production costs calculate lower, the country has less access to international markets due to foot-and-mouth issues. In comparison, Canada beats the United States for sow costs, but the importing of grain to finish hogs drives its overall production costs higher. China’s much higher production costs are a result of expensive feed costs. Also, productivity is less as biosecurity is challenging with a greater density of sows in a geographic area. Examining the data, Hayes explains even with the extra transportation costs and import fees, it is cheaper to bring in pork from the United States. However, ractopamine-produced pork continues as a barrier. 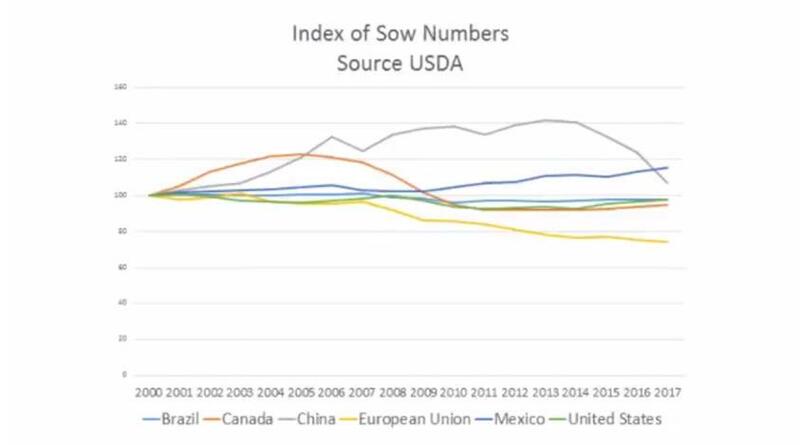 As for sow numbers, South America and North America are trending higher while China and the European Union show a decline presently. Hayes presents the sow numbers in the following chart. Although China and the European Union appear to be on a downward trend for sow numbers, the decline in sow numbers is the reflection of removing unproductive sows from the herd. Early in year reports from China indicating expansion mode was starting, however, Hayes presents a statement release from China from two weeks ago that states the opposite. Hayes explains this pencils to 6 million reduction in China’s future sow numbers. Hayes confirms that Ireland, Great Britain and Spain are adding sows to their herds. “The one thing that might concern you is if all Americas are expanding then we better have a market for all this product. You don’t often see all the countries expanding at once,” notes Hayes. Overall, U.S. hog farmers are extremely competitive with low production costs and superior efficiencies. As reflected in the USDA long-term projection for pork exports by country, the United States is an excellent position for export growth (refer to figure below).